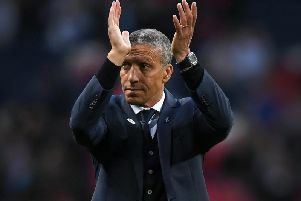 Brighton & Hove Albion manager Chris Hughton has spoken about fans' criticism of the 4-3-3 formation the Seagulls have played in recent months. Many supporters were critical of the formation after Albion lost 5-0 at home to Bournemouth and had just one shot on target on Saturday. 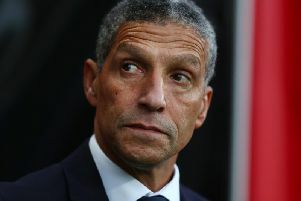 Hughton went for a 4-4-1-1 formation for much of last season as the Seagulls finished 15th in the top flight but switched to 4-3-3 earlier this campaign. Brighton are 17th and five points clear of third-from-bottom Cardiff heading into tonight's game between the sides. Asked about the change of formation and potentially sacrificing one area to improve another, Hughton said: "That is always the balance and I remember changing the system. We'd won, I think, a couple of games, with the system we were playing and one of the arguments there was that we weren't playing particularly well. "Certainly I think a change in system there saw us, certainly on the ball, being better. "Systems is one thing, it's about a player. Pascal (Gross) we've missed in a position we've played him (No. 10) so often. But we can always talk about formations and for a change of a 4-4-1-1 to a 4-3-3, it depends how you look at it. "It gives me three players with more opportunities to score - your wide players are playing higher up. "We can always talk about systems. It's about performance, the quality of the teams we are playing against, competition, and for me not so much about formation." Gross has missed the Seagulls' last seven matches with a hamstring injury and asked if Albion are short of another player who can play the number ten role, Hughton said: "Yes. Earlier in the season we played Solly there for a while. No doubt Solly's best position is in the wider areas. "Apart from a 4-4-2 where you are playing two number nines up front we probably don't really have that natural number ten. "Alireza (Jahanbakhsh) can play and has played off the front but we certainly don't have that natural ten that can play in there."